If you are looking for a tourist guide to Calabria, this is not it. This is a 300-page, large-format publication that essentially depicts one man’s love affair with this southern Italian region and how he has managed to visit practically every corner of it. Edward Mallia often returned to an area to look up a particular spot he had not visited before. His trips are rather in the style of the Grand Tour and his account is beautifully, yet simply, written. The book is an ideal introduction to this incredible regione, rich in both cultural and natural heritage. It would, I am sure, entice those who know nothing about it to explore the region for themselves. Though very popular at the time of the Grand Tours, Calabria has been practically abandoned. Years of kidnappings and other criminal activi­ty made it a no-go area. I remember President Emeri­tus ċensu Tabone, who every summer drove up through Italy for his holidays rather than go by air, telling me it was an area to bypass as quickly as possible – not that its notorious roads helped make it a very quick phase of his journey. I got to know some parts of Calab­ria quite well, though I do not know it as intimately as I do Sicily. In the first place, I received my doctorate in conservation at Reggio Calab­ria, a small, beautiful and quiet town that has a natural charm to it. My frequent trips meant I got to know some people quite well, such as my taxi driver, who would only ask to be paid on my last trip. For years I tried to help the city of Gerace, an incredible place up in the hills which has some beautiful churches, including a Norman cathedral, amid the charm of abandonment. The problem with Gerace is that it is eight kilometres from Locri and has never summoned up the courage to try to change the course of its own history, as long as Locri retains its grasp upon it. In the end, I had to give up – what a pity! Calabria is the only region in Italy with no World Heri­tage site (although there is the feast of Palmi, which is on an intangibile World Heritage list). Gerace would be an excellent candidate. The Knights of Malta had a significant presence in the region. But it is only correct to point out that a lot of the important heritage is in ruins, awaiting some EU funding that never arrives. 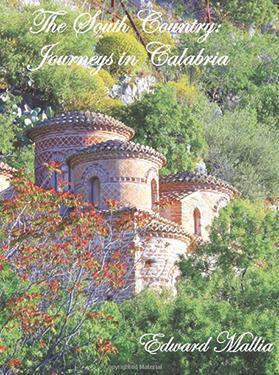 Mallia’s journeys take us to all corners of Calabria. I must admit that in spite of having read a lot about the region in the past, I learned a lot from the book. The history of each place is well intertwined with the current situation. The good thing, from the writer’s point of view, is that though the book is the result of many journeys, change is so slow to come to Calabria that most of what he wrote about remains as is today. For instance, in many places local trains still have wooden seats. The Italian State has abandoned the region, though some important national politicians hail from there. In a way this has helped preserve many of its little towns and villages, but locals struggle to survive, in spite of the region’s outstanding natural landscape of forests, among the most beautiful in Italy, as well as the great amount of cultural heritage to be seen everywhere. There is so much, in fact, that if I were to start extensive trips there, at my age I could never see it all. I find one the most intriguing aspects to be how it has managed, even today, to maintain a much stronger link with the East than any other Italian region. Mallia is very kind to the locals, whom he finds mostly friendly; they are often described in great detail, perhaps too much detail in some cases. But this is part of the book’s fascination. Rather than an account based on history, the history is woven into the story. This is a book I have not found in Italian, except for the volumes depicting the Grand Tour. It would be a great bonus for Calabria if it were to be translated into Italian. I like Mallia’s style of writing because he avoids judgement and is more interested in facts, telling us what a traveller, rather than a tourist, would expect to find in each place. Again, there may not have been the need for details such as the options available to travel from one place to the other (or even the best place to take a coffee) but it would all make for a great summer read. Mallia is both fascinated by Calabria and, like me, awed by the beauty of the place and the number of sights there are to visit. Of course, the region has big problems related to crime but the traveller should be able to avoid any form of contact with this aspect of it. The locals have a non-committal attitude to work, and working hours are flexible. But after a few days one would get used to this and be able to find a friendly local to help, as Mallia often did. Rather like the region itself, this is not a book to rush through but rather to find the time to settle down to and pore over slowly, whether or not you have a particular interest in visiting the region. I can say that it has upset the reading goals I had set in my post-retirement list – Mallia’s intriguing account of Calabria is now at the top of that list for a more leisurely re-read. Ray Bondin is a UNESCO world heritage expert.